This is an interview with Helen Miller Lynch, a certified X-ray Technician/Nurse Practitioner specializing in cardiovascular intervention. She has broad experience in cardiovascular disease from the University Hospital in Örebro, Sweden, and the heart clinic Feiringklinikken, Norway. She became curious about MediYoga after some colleagues attended sessions during stress-related sick leave, and returned to work with a whole new vitality. She is now a certified MediYoga Therapist and MediYoga International teacher. Rob Schware, GBYF Executive Director: I’m interested in the origin and growth of MediYoga in Scandinavia. What is it? Helen Lynch: MediYoga was established and developed by Göran Boll at the Institute for Medical Yoga in Stockholm, Sweden. MediYoga has its origin in classic Kundalini yoga and started to take shape as early as 1998, when an initial partnership project was launched with the Karolinska Institute in Stockholm. This consisted of a study of what yoga could offer patients with chronic back pain. Many different studies have been undertaken since then involving MediYoga and its effects on various patient groups, and on medical disorders in general. These include studies performed at large companies, such as the Post Giro Stress project in 1999, and the Swedish Enforcement Authority Stress project in 2009. Read more: MediYoga can save society millions of dollars each year. Since 2004, MediYoga has been one of the most popular rehabilitation options for employees on long-term sick leave at AstraZeneca Corp. MediYoga is now recommended by healthcare professionals throughout Sweden and Norway as a simple and therapeutic form of yoga that anyone can do, whatever their physical or psychological limitations. What originally motivated you to do this work, and what continues to motivate you? How, if at all, has that motivation changed over time? Scientific research shows that stress in various forms is the underlying cause of most of what we call illness, and that powerful tools are needed to re-establish and maintain balance in our lives. MediYoga is a practical tool that has shown measurable effects on back and sleeping problems, high blood pressure, ventricular fibrillation, various emotional problems, and other medical disorders. There’s nothing better to hear after a class than, for instance, that someone with high blood pressure who’s been on medication for years is able to cut down on their prescription medication intake, or to eventually completely stop. That’s motivation for me. Just to see their faces after a yoga class, quiet and peaceful with eyes that radiate, it goes straight to my heart. Is there a standout moment from your work with MediYoga, or with heart patients? A personal memorable moment was when I received my Gold MediYoga teacher/therapist pin, and realized all the hard work and hours and hours of time had elevated me into a dedicated group of individuals striving to help others. What advice would you give to anyone who is going to teach in hospitals, and with patients? Invite the Board of Directors at the hospital for an experience in MediYoga. They have to experience the effects of yoga themselves to be able to better understand them. Be humble: you are meeting people with various medical conditions who mostly have never tried yoga before. Demystify the experience, and make the participants feel safe and relaxed. Build up a trust between you and your clients–let them know you are there for them.You also always have a solid foundation to build on with all the scientific research that is done on MediYoga. A great challenge has been introducing yoga into the medical community that is so accustomed to scientific means and results. When I started to implement my ideas here at the Feiringklinikken heart clinic for open heart surgery, cardiovascular intervention, and heart rehabilitation, there were many questions: what is MediYoga, how does it work? I developed a research presentation on specific heart patients and heart diseases that involved MediYoga and presented it to the Board of Directors of Feiringklinniken. The President of the clinic is a very open-minded leader; he saw and believed in my passion for MediYoga and the way it works. We developed a six-month trial project for MediYoga in the Rehabilitation Department. Patient and staff feedback and reviews indicated the trial was a great success. Now for the second year, Feiringklinikken includes MediYoga as a rehabilitation option twice a week for heart patients. Feiringklinikken was the first hospital in Norway to offer MediYoga to its patients; many other major medical institutions have begun to offer programs similar to our clinic’s. We talked about your plans to introduce MediYoga to the US. What are some of your ideas about, or hopes for, the future of “service yoga” in America in the next decade? My hope is that MediYoga will become a standard part of medical treatment offered throughout society. I hope educating MediYoga instructors in California in February 2014 will be the start to integrating MediYoga in the U.S., as it was in Sweden and Norway. MediYoga is now a treatment and rehabilitation option offered in over 120 hospitals and primary care units in Scandinavia. What makes us unique and differentiates us from all other forms of yoga is that everyone who works with MediYoga–instructors and yoga therapists–has health profession qualifications and understands the effects of yoga from a medical perspective. From our health education we are able to understand possible side effects, the emotional impact of a diagnosis, and how to offer safe yoga practices. Most patients have never participated in a yoga class before, so this is something completely new to them. For example, here at the heart clinic I have 20 participants in each class between the ages of 20 and 80. They all have some kind of cardiovascular disease, so my approach is to use MediYoga programs with breathing exercises, postures, and meditation that targets heart diseases. No matter what group you are targeting, you have to approach them with the right set of tools that you know works on just that specific disorder. Instead of it being an individual practice on the yoga mat at home, I now have the possibility to share with others. When applying my service in the MediYoga programs I am not affecting only a single person, but everyone around them and connected to them when they leave the room. ~Nobel Peace Prize recipient Muhammad Yunus’s inspiration for the Grameen Foundation, which helps the world’s poorest people reach their full potential, connecting their determination and skills with the resources they need. ~The Give Back Yoga Foundation, for its commitment to helping to bring yoga to diverse segments of society that have limited or no access to yoga in their communities. ~The Inner City Garden projects, bringing a healthy alternative of self-sustaining local neighborhood/community garden areas. Dharma. Service in Action. 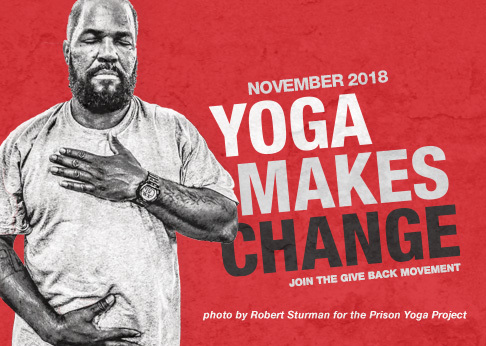 SYF Gives Back: Mindful Therapeutic Yoga Practices for Veterans. Join us at this two-day pre-conference teacher training hosted by the Sedona Yoga Festival in partnership with the Southwest Institute of Healing Arts, and learn techniques and practices that are clinically proven to offer relief to veterans affected by PTSD, TBI, and other trauma and emotional stress. February 6-10, 2014 in beautiful Sedona, Arizona.